Are you one of the many that have not yet filed your tax return for 2017, or any other year? The good news is that it’s not too late to file. While it is true that there is an official tax deadline date of midnight April 30th, 2018 you can still file after this date. Excited? We thought you might be, so why not email us with your T4 and we can get the ball rolling on what will hopefully be a juicy tax rebate before summer starts. If you still have some questions on tax returns and what you need to file then here are a number of the most commonly asked questions. How do I get my T4, and what is it? In order to provide an accurate quote and file your tax return, we will need a copy of each of your T4s. A T4 is a summary of your earnings that is provided by your employer. If you don’t have one then get in contact with your employer right away, and most are very quick to provide it to you. Once you have this, send it through and we’ll get a quote to you in 24 hours. Sound like a plan? I only worked part of the year, can I still claim my tax back for 2017? One of the most common misconceptions is that if you only worked part of the year, it is not worth filing. Depending on your tax residency status and a number of other issues, part-year returns often produce the largest tax rebates. How do I determine my Canadian tax residency status? While some things in life are black and white, unfortunately determining your Canadian residency status for tax reasons can be anything but straight forward. Fortunately, we are here to help and can provide a free quote and consultation, helping to determine if you are a resident, non-resident or anywhere in between (yes, there are more than just two, such as Factual and Deemed resident). The information from CRA on tax residency is unfortunately not as helpful as other areas of their website, so if you are in any doubt then get in contact, we’d be pleased to help. What is the cost of filing my return? 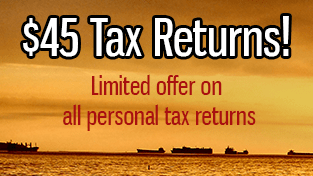 We offer one of the cheapest tax returns in Canada and charge a flat $45 fee for a personal tax return. Unlike many other taxback companies, we don’t charge for additional documents. For those that are self-employed, it is a flat $150 fee. This is inclusive of GST and any other hidden fees that can often be added on. If I am no longer a resident in Canada, or have left the country, can I still file? Most definitely! Every year thousands of people leave the country without filing a Canadian tax return. For those that have left Canada or no longer reside in the country, it is still quick and easy to file your tax return. If you have any unaswered questions then don’t hesitate to get in contact with us. We don’t bite, promise.